This entry was posted in Announcements, Barack Obama, Chicago machine, Citizens for the truth about Obama, Community Organizer, Corporate accountability, Democrats, doublespeak, Election, Election 2008, Election update, FEC, Federal Court, Fox news, Government, Hillary Clinton, Illinois, Impeach Senator Obama, impeachment, indictment, John McCain, Justice, Lobbyist, News, Obama impeachment, Obama indictment, Obama Nation, Obama records, PHILIP J. BERG, Politics, Senator Obama, The Case Against Barack Obama, United States, voters and tagged Campaign contributions, Fannie Mae, Freddie Mac, Lobbyists, More Obama lies, Mortgage crisis, Obama, truth about Obama. Bookmark the permalink. MY BAD!! MY BAD!! MY BAD!! McCain is 62nd on the list. That’s my bad and I take full responsibility. That’s what the article said that I was reading though. So sorry. I can’t apologize enough. But one last time. Sorry! And lucky for them, NOBODY IS WATCHING. A desperate Fed pumped an additional $96 billion into the banking system yesterday, and the European Central Bank, the Bank of England and the Swiss National Bank, added some $55-$60 billion into the banks. The Fed injected capital three separate times, to provide liquidity to panicked banks. This is going to lead to hyperinflation! Look, if you called a veterinarian because your dog is covered with blood sucking ticks that are killing him and that vet simply connects an IV to your dog to replace the blood, you would call him nuts. The cure is to remove the parasites! These delaying tactics are simply making the problem worse. Stop this bail out process! We’ll need the blood later to recover. Put the financial system under bankruptcy protection right now. Whatever isn’t going to function, put into bankruptcy reorganization. Anything that is in trouble goes into receivership. Just to kick off your day citizen! Another opportunistic moment for the Dems! Is there any human suffering that they will not seize for political gain? Leave it to CNN to completely miss the greater context of this story: namely, McCain’s longtime–and hillarious–use of Streisand as his foil. I watched it over and over and just laughed out loud!! I would like to know more about the CEO of Fannie Mae who worked on Obama’s campain, supposedly vetting VP candidates. What was their arrangement? It is amazing; Obama accuses Sen. McCain of being tool of the special interests while his associates are in jail and are in hiding. How does above compare to Sen. Barack Obama OPTING-OUT to take the $85 MILLION in public financing for this election. THIS WEB SITE IS A BUNCH OF LIES!!!!!!!!!!!!!!! Back it up with documented facts. John McCain has a huge number of lobbyists from financial institutions, banks, and finance companies. Yet this chooses to focus on one: Fannie Mae. AS IF Fannie Mae is solely responsible for this financial mess. It is not. Fannie Mae had a specific legal obligation to sell housing bonds. Banks provided the insurance — they failed taking Fannie Mae down. Thank God this web site is so inept as to be lost in the weeds of the internet. The viewership on this blog is skyrocketing. And of course, you found it and responded. Is lying endemic with McCain supporters? Please note that John McCain received $169,000 from officers, board members and lobbyists for Fannie Mae compared with $16,000 received by Obama. Of course Obama has received more contributions from employees of Fannie Mae and Freddie Mac than John McCain during the campaign and is the number two recipient of their donations. If you check at Open Secrets, you will see that Obama is first or second in donations from virtually every corporation, presumably because they are more interested in seeing him be elected than McCain. I was just about to put up the same info about John McCain and his misleading info, especially on the Fannie Mae & Freddie Mac issue. The sad thing is he is still spreading that false info on his campaign trail. I also would like people know that the Troops are behind Barack Obama also giving him the most donations for his campaign….. I guess we see where the troops stand at who they would like to see as the next President. THE TRUTH IS more than 95% of those donations are from individual employees of Fannie and Freddie. So basically that just means regular employees would much rather donate to Obama than to McCain. That’s no big surprise. The surprise is that all of a sudden those work-force Americans that McCain claims to be the “fundamentals” of our economy are now considered to be bad people for donating to a presidential campaign? Down at the bottom of the chart where that figure originally was found on the Federal Election Commission disclosure pages it indicates that the number includes contributions from PACs and individuals. Obama received a total of $6,000 from a Fannie/Freddie PAC — and only prior to his campaign for Presidency, when he announced he would no longer take any lobbyists PAC money. The remainder was from individuals who are employees of Fannie/Freddie, in the years between 1989-2008. The two companies at one time had over 12,000 employees. 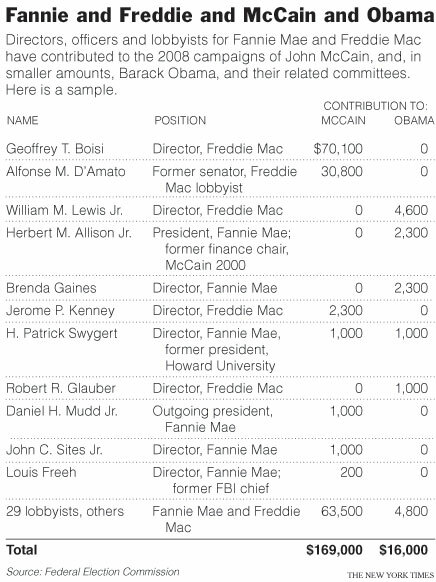 Fannie Mae and Freddie Mac employees donated $126,349 to the Obama campaign while they donated $21,550 to McCain. (Corporations themselves are ineligible from donating to political campaigns.) Whereas, Fannie Mae and Freddie Mac board of directors and lobbyists donated $169,000 to McCain and his related committees, compared with $16,000 to Obama and his related committees. You’re a racist for posting this. How dare you post facts that could hurt Obama. Getting our first Black President is much more important than our national prosperity.